A series of spectacular waterfalls on the River Keltie in a gorge about a mile from the farm. By car - drive into Callander and just before the first shop (Post Office) on the right, turn right into Bracklinn Road. Continue up the hill, over a bridge and at the top of the hill, turn left then right into the woods road. The Falls car park is about 1/2 a mile up this road and is signposted. The track to the falls is behind the car park. (15 minute walk ). By foot - take the track behind Auchenlaich and follow past the caravan park and as it turns left to climb past some woods. The track passes through a plantation of conifers then meets another track at a T junction. Turn right and down some rough steps leading to the falls. A (Pictish?) hill fort on a low hill north of Auchenleich, one of three in the Callander area. By foot - take the track behind Auchenlaich and follow past the caravan park and as it turns left to climb past some woods. Before you come to the conifer plantation, look on the right for a track leading back into the woods. The hill fort is an earther wall forming a circle with a space where the entrance once was. 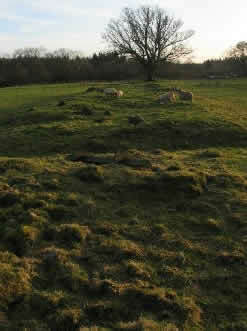 Auchenlaich is the longest megalithic burial cairn in Britain. Auchenlaich Cairn consists of a ridge of grassed over stones which stretches for over 350 metres in a perfectly straight line, from a field behind Auchenlaich farm and well into another field to the north. The farm track cuts right across the middle of the cairn. Auchenlaich long barrow runs in a NNW to SSE direction. Central Scotland's only red kite feeding station where visitors can watch these exciting birds and their spectacular flying. The farm lies on the Braes of Doune in the area of Central Scotland where the RSPB and Scottish Natural Heritage have reintroduced the red kite. Food is put out for the kites each day throughout the year. Up to thirty or so are attracted to the food depending on the weather and the season. Watching from the hide you will have the chance to view the spectacle of the kites' flying acrobatics set against the backdrop of our hill fields. Kites tend to feed on the wing and so you will see them swoop down to seize the food in their claws before they soar upwards again, sometimes being challenged by another bird for their haul. Argaty is a working farm, booking is appreciated though not always essential. Drive to Doune, turn left and continue through the village. After about 2 miles watch for the Argaty sign on the left. Stirling could keep you busy for a full day. 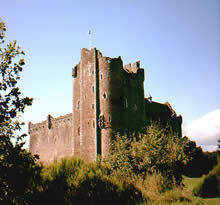 Built by Robert Stewart, Duke of Albany in 14th C.
Open all year except Thursday PM & Fridays in winter. Drive south from Callander for about 8 miles. Take first left after 30 limit sign at Doune. Drive slowly through the town and at the far end see signpost on your right. This is the heart of the Trossachs - take your camera! 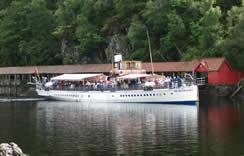 From around May to October the 100 year old steamship 'Sir Walter Scott' and a smaller cruise ship 'Ellen's Isle' offer a variety of cruises on the loch. In winter the smaller ship offers a more restricted service. Tel 01877 376 316 for details. At the Trossachs Pier there is also a restaurant and souvenir shop (and toilets). A car-free tarmac road follows the north shore of the loch to Stronachlacher. This peaceful road provides a pleasant walk and for the more adventurous, bikes can be hired at the pier to make the most of your day. Drive through Callander to Kilmahog and turn left onto the Trossachs road. Enjoy the scenery as you travel alongside Loch Venachar, through Brig o' Turk and past Loch Achray before turning right to go through the narrow pass of the Trossachs to reach the pier car park. The forest park covers a huge area and has a network of forest paths and drives. The 'hub' of the Queen Elizabeth Forest park is the 'David Marshall Forest Lodge' on the scenic Duke's Pass near Aberfoyle. The Duke's pass is a high level scenic route from Callander to Aberfoyle. In the Centre is a viewing roon where Ospreys may be observed on their nest via closed circuit TV. The 'Waterfall Trail' takes you round a series of spectacular cascades including the beautiful 'Little Hind' falls. The 'Highland Boundary Fault Trail' takes you to a high vantage point with panoramic views before returning via the Highland Boundary fault where you can stand with one foot in the highlands and the other in the lowlands. Go via Callander to Kilmahog. Turn left to the Trossachs road and continue on this road past the Loch Katrine access and up onto the Duke's Pass. As you start to descent to Aberfoyle, watch for the Centre on your left. Glen Ogle is a dramatic highland pass leading from Lochearnhead to GlenDochart. Queen Victoria called it 'Scotland's Kyber Pass'. The modern road, an old military road, the GlenOgle burn and the trackbed of the Callander - Oban railway line (now a cycle/walkway) all pass through this narrow and beautiful glen. Try parking at the top and take a walk down the cycleway to the railway viaduct to get the best views. Killin, at the west end of Loch Tay, is the home of the Clan McNab. The McNab burial ground is on an island in the river Dochart just below the beautiful old arched bridge. 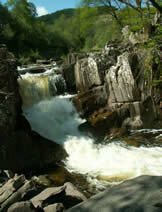 The bridge is also the best place for that unforgetable photo of the Falls of Dochart. A little way beyond Killin is the Ben Lawers mountain range and visitor centre - a favourite starting place at 1400 feet for a days walking in the mountains. Take the A84 through Callander and head north. GlenOgle is just beyond Lochearnhead. After GlenOgle, continue to the bottom of the long descent at Lix Toll and turn right to reach Killin in about 2 miles. Balquhidder Glen has for long been associated with Rob Roy MacGregor and his clan. It's a beautiful place to visit, with marvellous views and reflections in Lochs Voil and Doine. The grave of Rob Roy, his wife Mary and 2 of his sons is at Balquhidder church. A short walk up the hill behind the church leads to 'the MacLaren's Meeting Place', a viewpoint with a stone marking the traditional meeting place of members of that clan. At the west end of the Glen is Inverlochlarig, where Rob Roy lived and kept cattle in his latter years. Between King's House (a hotel) and Balquhidder village a building resembling an old church can be seen on the left at Achtubh. This is the mausoleum of the Clan MacGregor. Drive north on the A84 through Strathyre then after about 2 miles take the right turn to Balquhidder (the road then doubles back to head west). The mausoleum is 1 mile and Balquhidder church 2 mile along this road.